When regulations and chain of custody liability prevent your hard drives and associated media from leaving your facility for data destruction, let Synetic Technologies bring our data destruction vehicle to you. Our mobile data destruction truck is called the Data Annihilator™ (“DAN” for short), and for good reason. The Data Annihilator™ is a self-contained mobile hard drive shredder. There is a lab in the front of the truck where your hard drives and associated media are loaded onto a conveyor belt, which carries the assets to the shredder. The shredder’s four powerful, rotating cylinders grind the pieces until they are small enough to fit through a screen into a collection bin. The materials are rendered breach-proof and then recycled according to strict R2/RIOS™ policies that protect your data and the environment. Synetic offers both Virtual and Physical Data Destruction Services under the Data Annihilator™ brand. 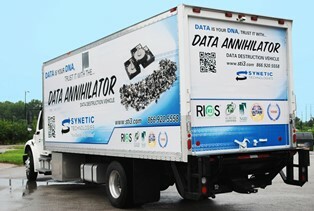 The Data Annihilator eliminates your chain of custody concerns. HIPAA, HITECH, PHI, PCI, PII, FACTA, GLBA and Sarbanes-Oxley regulations governing industries such as banking, finance, healthcare and government present chain of custody problems for companies. Synetic’s on-site data destruction solves those challenges, giving you tailored solutions that meet your internal as well as federal and state compliancy needs. 60% of all data breaches occur at the business associate (your vendors) level. Trusting data destruction requirements to anyone other than a company that is vetted, audited and certified can be expensive after a data breach. Synetic’s on-site data destruction ensures your assets never leave your sight before they and the data they contain are destroyed, eliminating the threat of a breach. A digital camera system streams and records the entire on-site data destruction process. The Data Annihilator™ is equipped with a digital camera system and 4G LTE. Cameras capture the conveyor belt leading to the shredder in the back of the truck. Another records our trained, experienced technicians handling your hard drives and media as they drop the materials on the conveyor belt. A camera in the rear of the truck records the materials being shredded and sifted through the screen into the container for recycling. Clients are welcome to watch the entire process live from inside the truck’s lab or via an encrypted video stream to their PC or mobile device via the Data Annihilator™ Companion App. Once the data destruction is complete, Synetic provides a notarized “Certificate of Destruction” and a digital video file(if requested) for confirmation of proof. An audit report is also available, customized to your unique specifications to ensure appropriate IT asset management from start to finish. When it comes to destroying hard drives on-site, we’ve thought of everything.